Abeg police should storm the place and arrest any spirit inside, after all government don't believe in evil spirit and demonic operations. Smh! Police officers were called to handle a situation but what they met there was beyond their might. People report cases of paranormal activity somewhere around the world virtually every day, but it’s not often that you hear police officers actually confirming these occurrences. However, that’s exactly what happened in a Chilean city, when police investigating a domestic disturbance were allegedly attacked by mysterious forces. According to Oddity Central, on February 26, 2017, a group of Carabineros – Chilean police force – were called to investigate a home in Puerto Montt, after the desperate owners called the emergency number to complain that they were being terrorized by unnatural, evil forces. When they arrived at the house in the municipality of municipality of Fe y Esperanza, they noticed several broken windows and a partially burned mattress in the yard. The owners were outside and as soon as they saw the police approaching they started telling them that there was strange paranormal activity inside the house. Obviously, the Carabineros didn’t believe them, but they quickly changed their mind once they went inside to investigate. Second corporal Boris Olavarría González, of the Sixth Police Station in Puerto Montt, told reporters that he and his colleagues were questioning the owners inside the house when a trowel fell from the attic like somebody had thrown it down. After checking the attic and confirming that it was empty, González claims that he called out the “demon” asking it to leave. After receiving no response, he decided to go back outside, but on his way to the front door he was struck from behind by a knife. When the owners of the house first called the police, they mentioned levitating objects and things bursting into flames for no reason. The Carabineros later confirmed that they saw smoke inside the house even though there was nobody in there who could to start a fire. Marria Urra, one of the owners, told Cooperativa that spontaneous fires had been keeping them awake at night for weeks, and she and her husband were terrified that the house might burn down while they were sleeping. The Urras said that the paranormal activity began on February 8, but it was never as bad as it was two nights ago, when they couldn’t take it anymore and called the police. And they are not the only ones claiming that sinister forces have taken over their home. 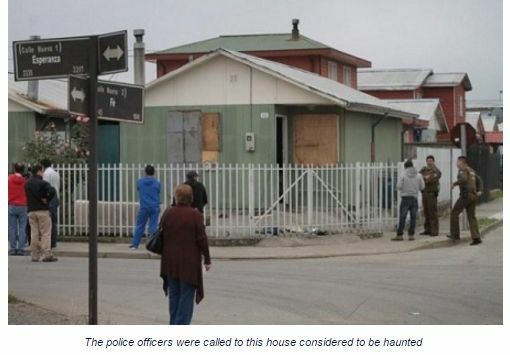 Alexiz Ruiz, of the Puerto Montt Informa portal, claims to have experienced the paranormal activity inside the Urras’ house first-hand, when interviewing the owners. He said that one point his left arm went completely numb for no reason, and that he started feeling overwhelmed and depressed all of a sudden. Also, he reports losing reception on his mobile phone. 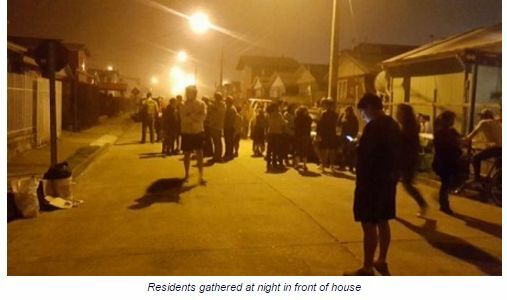 Arturo Sánchez, an official of the Community Development of the Municipality of Puerto Montt, also claims to have witnessed bizarre activity on February 26. After the police were unable to identify the source of the disturbance, Sánchez was also summoned and he claims to have seen windows breaking for no apparent reason and hearing strange noises in places that looked empty. Priests were called to the “haunted” house as well, but they couldn't drive away the said "spirits”. At 2am, the owners of the hose were relocated to a social center around 300 meters from their house, where they will remain until someone figures out how to make their home safe again.